Is the Klarus XT1A the perfect tactical flashlight? Compact, handheld 4.2 inches torch weighing only 2.24 ounces with 1 x 14,500 lithium or 1 x AA battery, which produces 3 lighting levels and 2 operating modes (outdoors and tactical) at up to 1,000 lumens. Oh, and at around only $50. If not perfect, it's certainly close. What goes into a quality tactical light? In my article about Tactical Flashlight Manufacturers, I discuss a number of quality companies that specialize in producing some of the best tactical lights available. But, what distinguishes a mediocre tactical light from a quality tactical light? There are three areas which denote “world class“. Quality lights are constructed of aerospace aluminum or high-grade polymers which render them virtually indestructible and waterproof. The lens is constructed with mineral glass which is coated with anti-reflective compounds which optimize light transmission. The reflective cone is designed either to spread or concentrate the light beam as dictated by the designer. Additionally, they utilize a specific CREE light emitting diode (LED) which is specifically matched with the lithium power source and digital power management chip (DPM). You can view these various components on my infographics on How to choose a tactical flashlight. Most lower quality lights use such components at plastic lenses, which are shaped like a magnifying glasses to eliminate the need for a reflective cone. They also use cheap metals, non-CREE LED's and unreliable DPM's. Consequently, you can't rely on these lights and any cost savings will only be temporary. The various features of a high-grade light include both the quantity and quality of power levels which are realistically rated in lumens. The ability to easily access a strobe is critical for defensive purposes. Also, the capability to change modes which orients the light towards tactical or outdoor use is helpful. Finally, such attributes like the ability to check the power level, a batter which is rechargeable and ease of access to various light modes are beneficial. The final area which relates to world class is the purpose of the light. Some tactical lights which are designed for police and military use only have one light mode and the tail switch is only momentary. This is by design and the purpose of this light is to avoid any unintended light when in a critical tactical situation. Other lights, such as the Coast G19 sport a narrow inspection beam. Again, this is by design for a specific purpose. The point is that you need to determine your purpose and then decide on the right tactical light. For everyday carry (EDC), the Klarus XT1A may be the perfect tactical light. The Outdoor mode is momentary and permanent on/off High with button and, while on, high/med/low cycle on the paddle with strobe after two seconds and SOS after more than 2 seconds. While off and held more than 1 second you can also activate the cycle. The Tactical mode is also momentary and permanent on/off High with button and while on, high/med/low cycle on the paddle and when off, instant strobe through the paddle. Both switches lockout with 1/2 turn of tail cap. There's not a lot to criticize about the Klarus XT1A. Of course, if your purpose is something other than everyday carry, you may be looking at the wrong light. Again, depending on your needs, you may want to review other options. But, for EDC and with all the world-class qualities and features that the XT1A offers, this is a winner. I personally like the Tactical mode and believe that the paddle switch is a true innovation. I would like to have the lockout switch controlled vs. manual but I can live with that. For example, the Klarus Mi7, another great EDC torch (covered in this post), allows for a lockout by pressing and holding the switch until the light goes off then flashes. This is a minor issue but worth considering. 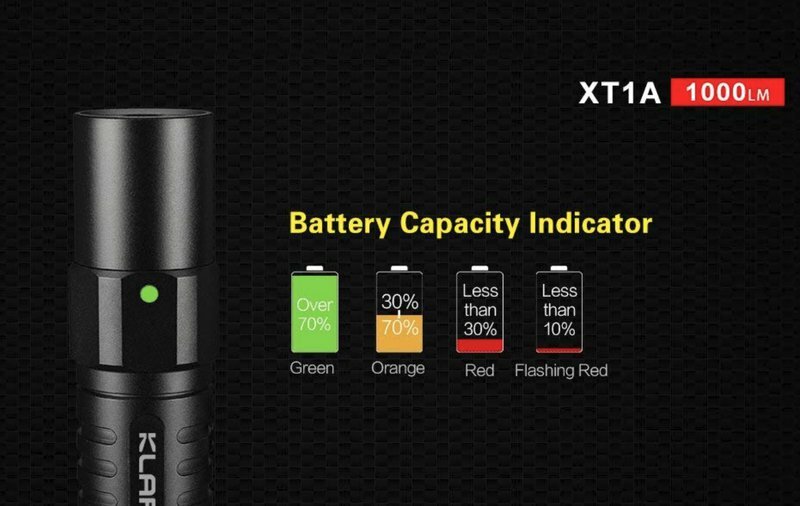 The XT1A, however, is 1000 lumens while the Mi7 is 700. The difference is real. Size may be a tad too much on the Xt1A. It's fatter and about an inch longer than, for example, the Mi7. I can easily fit the Mi7 into my jean key pocket, but I can also fit the XT1A in my key pocket. I wear the 5.11 tactical jeans, however, and they allow for a slightly larger key pocket configuration. So this all boils down to how you carry. All in all, it's hard to beat the Klarus XT1A. The quality construction, great tactical features and an all-around almost perfect every day carry tactical light for around $50. This may be my new favorite, I know I'm keeping it.